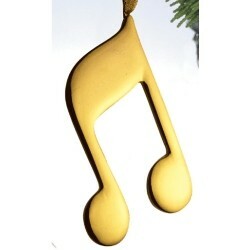 Put a little music in your holiday season with this beautiful double 8th note Christmas ornament. It is gold plated for a brilliant shine that will sparkle on any tree as holiday lights play off its surface. The musical note ornament will brighten the season for the music student, teacher or enthusiast when it arrives in our exclusive black velvet bag. Combine it with additional musical instrument ornaments from Russell Rhodes for a harmonious theme this year. Gift for son piano player Oct 28, 2014 Suciliah D.